One hell of a cold front is coming in. It's dropping temps 60 degrees in Montana. Not that serious here but my knee barometer will be pinging all day tomorrow. 10 degrees when we wake up on Monday, make sure your batteries are charged and clean. These guys are going to be on discovery's Storm Chaser series. I've got respect for these guys, but they also scare the hell out of me. Kind of a "Jackass" Storm Chaser special. I've touted http://www.tornadovideos.net/ for a couple of years and I'm glad to see them get exposure. Reed if by any strange twist of fate you read this, you got a fan in Wichita. Something of interest I found on Stan Finger's Blog over on the Wichita Eagle homepage. NOAA put this out showing the number of tornadoes this year vs Average. 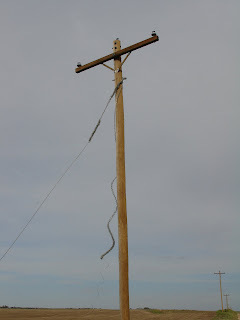 This had been an active year in Western Kansas. I remember a couple of times having tornadoes stretch from Liberal to Phillipsberg with 12 counties under warning at the same time. The following pic was a report of an outbreak. Wonder what the rest of the "Second Season" will be like? Wichita's had about 10 inches of rain in the last 48 hours. Don't worry, I'm as dry as a bone. "I'm happier than a tornader in a trailer park." Fake or real, or funny as hell??? 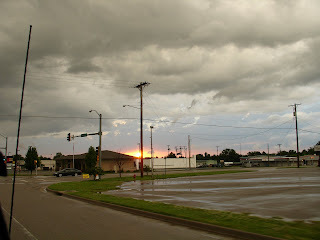 Not too much going on in Wichita as the summer weather pattern sets in and the weather becomes tedious and boring. There isn't much to chase when you have temps over 100 and high humidity except air conditioning. This week brought a couple interesting days. 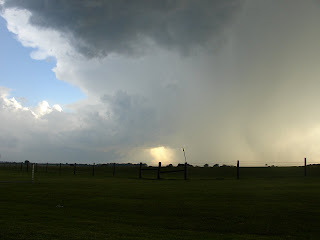 Tuesday we had 75mph wind and enough hail to make it look like it snowed hit about 4 miles away from the house. I-135 had four rigs blown off the road, and at one point the sheriff almost brought in snow removal to get rid of the hail. 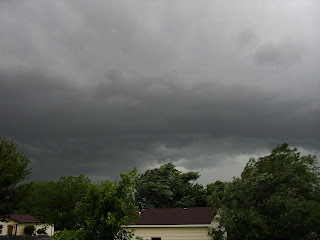 Friday had some torrential downpours and enough high wind to make the rain go sideways for a little bit. A couple of hours after the storm a nice shelf cloud came over the city. I ran to "the highest point in Sedgwick CO." and shot this. 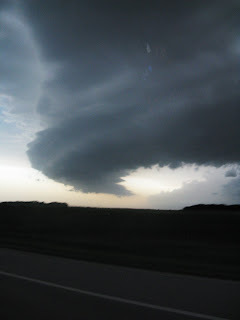 The upper level of the shelf cloud lowered and looked like a slow avalanche. Unfortunately, the downpour hit and obscured the shelf cloud. Needless to say, we are landlocked with boring weather. Something may pick up a little closer to Fall. 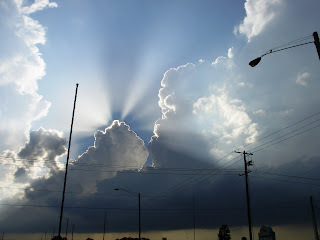 But occasionally you wake up, look outside and see a nice cloud like this the next morning after a storm. Apologies to my writer's group. You know that you are my kindred, but as Gary said "The storm is my mistress". 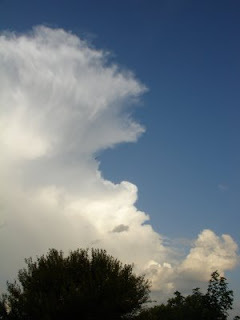 I walked out on the porch looking to the north towards Newton and saw the beautiful cumulus cloud cannibalizing everything in site. In other words, it was exploding. 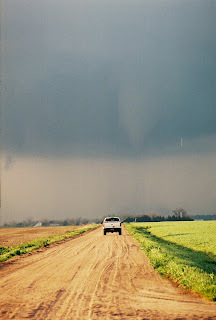 After watching the storm, we decided to chase towards Newton vs. Matfield Green which already had a tornado on the ground ( and continued to do so for several hours that night). Driving out of Park City, we began to see SCUD's (Scary Looking Clouds) developing to the NE and tried to intercept in Whitewater. The storm we were under appeared as if it was going to do something, until a large storm developed over Wichita and they began fighting. 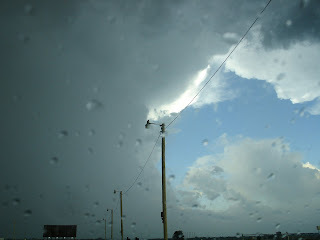 They both lost out quickly and turned into downpours. 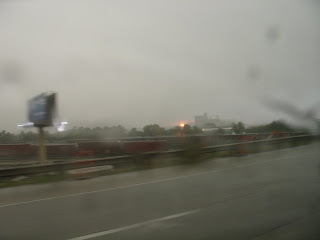 We gave up on the storms and headed back into Wichita through the rain. 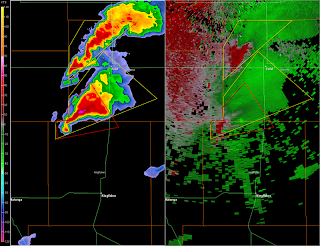 I made it home in time to watch KAKE warn about the tornado forming near Derby. We went back out and ran South. The sky was very black as the sun set with almost an apocalyptical beauty. The further we made it into the storm the scarier the sun looked. We made it into Derby about the time it got dark. 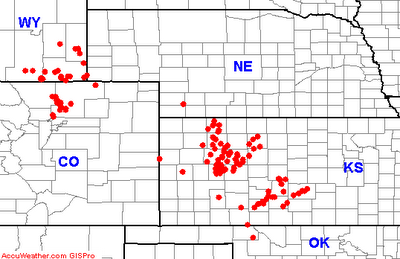 I had a pretty good feeling about where we were at due to the amount of KFDI, KAKE, KWCH chasers we found. The storm kicked up speed and headed out east at a good clip. Being in the dark, with the streets flooding all around us and electricity being questionable over town we decided to call it a night. She called around 9:30 running like hell down I-35 from I-70. This is the point that baseball size hail hit the airport. They made it out okay and sent pictures. 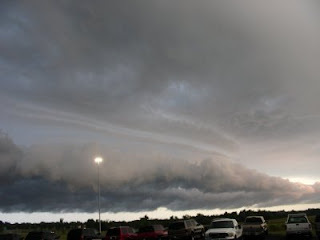 Unfortunately, this is the storm that went on into Chapman, Soldier, Manhattan, and had a body count associated with it. 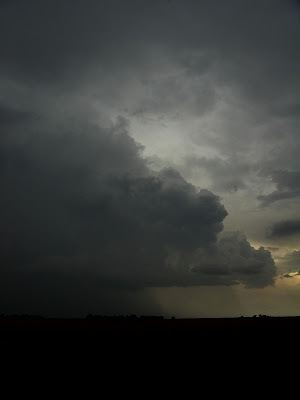 THE NATIONAL WEATHER SERVICE IN WICHITA HAS ISSUED A* SEVERE THUNDERSTORM WARNING FOR...SALINE COUNTY IN CENTRAL KANSAS. * UNTIL 1015 PM CDT. 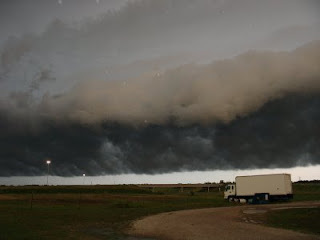 * AT 914 PM CDT...NATIONAL WEATHER SERVICE METEOROLOGISTS WERE TRACKING SEVERE THUNDERSTORMS CAPABLE OF PRODUCING DESTRUCTIVE HAIL UP TO BASEBALL SIZE...AND DAMAGING WINDS UP TO 60 MPH. THESE STORMS WERE LOCATED ALONG A LINE EXTENDING FROM GLENDALE TO 14MILES SOUTHWEST OF BROOKVILLE...AND MOVING EAST AT 54 MPH. Well the rather rotund female has sighed the last notes of "Parsifal". The storm of the decade turned into a moderate squall line and unleashed a herd of elephants. On this bright side, with all the doom and gloom, no one was injured. Taken in Newton looking out toward the Southwest around 5ish. I think NOAA issued the warning for Wichita due to some slight rotations in the storm and a flurry of calls saying funnels were falling. I think It was SCUDS. 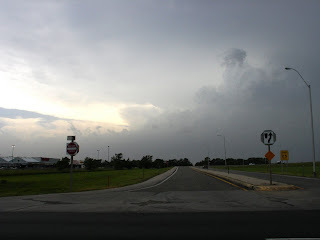 Taken as the storm entered Wichita's east side. 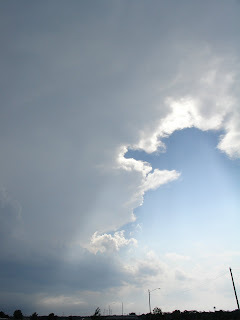 There were a few moments I wondered if I was staring at a wall cloud, then it fell apart. No harm nor foul, I've snagged my tornado for this year. The circus is in town in Wakeenee, Kansas. The tornado sirens and thunder spooked the elephants and they stampeded out of the fairgrounds. There are stampeding elephants loose in Wakeenee. I've never seen a high area this large. The weathermen are freaking out. I'm starting to sweat a little while chomping at the bit. And here I go waxing poetic at the doom to follow. Thursday could bring a tornado outbreak to the Great Plains, according to local meteorologists who are warning residents to pay attention to the weather. Computer forecasting models for the day bear striking similarities to the conditions present on June 8, 1974, when 39 tornadoes touched down in the southern Plains and killed 22 people -- including six in Emporia. 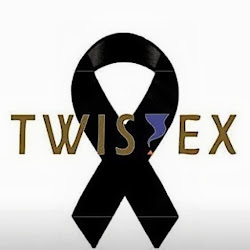 "I think this event warrants more advance warning," said Robb Lawson, a meteorologist with the National Weather Service in Wichita. The National Oceanic and Atmospheric Administration's Storm Prediction Center has been warning for days of an outbreak on Thursday. Forecasters disagree on where the highest risk for tornadoes will be. 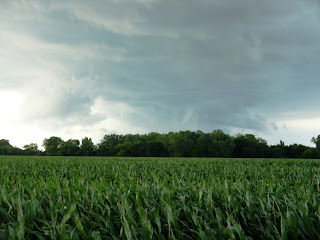 Many say Iowa and Minnesota, said Mike Smith, chief executive officer of WeatherData Inc., a subsidiary of AccuWeather. But Smith has his eyes on a corridor stretching from northern Oklahoma to central Iowa -- Enid to Des Moines. That includes Wichita and the surrounding area. "Certainly Wichita, Topeka, Emporia, Salina, Chanute... essentially the eastern half of Kansas should really be paying attention on Thursday," Smith said. 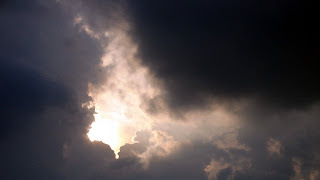 Temperature and humidity patterns for Thursday are similar to the 1974 outbreak, he said, and a wave of energy in the upper atmosphere is projected to be in exactly the same position as on June 8, 1974. The 1974 Emporia tornado touched down at about 6 p.m., grew to about a half-mile wide, and struck the city's northwest side, according to weather service archives. It injured 200 people and caused an estimated $25 million in damage in Lyon County alone, striking a shopping center, mobile home park, nursing home, an apartment complex and residential neighborhoods in Emporia and about 10 farmsteads in the surrounding countryside. 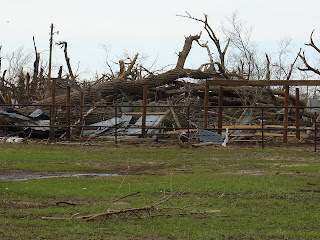 The tornado was rated an F-4 and had a 38-mile track through Lyon, Osage and Shawnee counties. With so much humidity in place, storms this Thursday could form and quickly become strong, forecasters say. And with wind speeds in the upper atmosphere resembling early spring patterns, any tornadoes that touch down could move at more than 50 mph. "If you take April dynamics and June thermodynamics," Smith said, "you have a potentially disastrous combination." 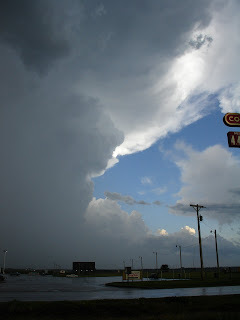 Photo: heavy rain from a 05/27/08 storm shot from Kechi, KS. Something of interest I "borrowed" from a message board. And they just put up a tornado watch for eastern Kansas. 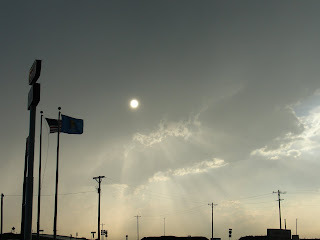 I'd been watching a cell develop since around 2pm near Enid, OK. Personally, I was hoping that once it got to strength, it would travel NE to us. It didn't. I called my oldest brother, Jeff, and asked if he wanted to go on an adventure. We left Wichita and headed to Oklahoma. At the Oklahoma Visitor Center we met a group from Wichita trying to get to the OKC airport. After a little discussion and finding radio with a storm chaser feed, we found out that the storm was moving toward Perry. 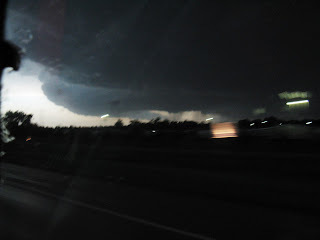 With the shape of the storm, that meant we had to core punch to get to the tornado. I hate core punching. 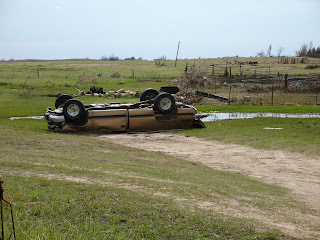 It's dangerous, stupid, and leaves you blind, but my brother was hellbent on seeing a twister. Damn it if he wasn't talking about the movie too. We left and started to hit some rain and very small hail. Although the interception in Perry, OK was happening sooner or later I started slowing down to avoid hydroplaning and damage from the hail once it got a little bigger. We arrived in Perry and found the tornados. 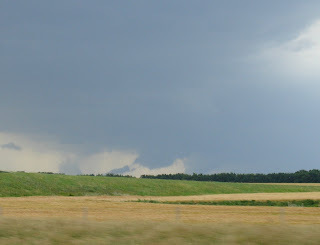 Two wall clouds positioned themselves close to one another, but were heavily rain wrapped. In other words heavy rain fell in front of the tornados obscuring our vision. We had a nice stovepipe funnel reach out of the rainshaft and dance around for a while before it dissipated. The chasers closer to the storm said there was a fairly large tornado inside that was rainwrapped. The rain stopped and the wall clouds seemed to die out. The entire area was cloaked in rain and the Perry Police started getting nervous. They told us we needed to go to shelter or go north on I-35. We went about a mile to the next stop. Another convince store with an overhang and a Subway. My brother had the munchies so he went in, paced around, and said their were about 50 people all trying to get into the women's bathroom for shelter. We hung out as hail hit the area and then went a little further north to get out of the rain. 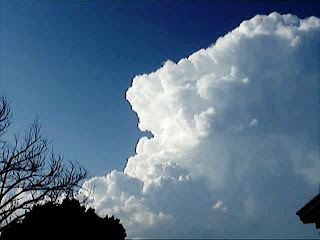 Before long, the national weather service reported that the storm was dying and had lost rotation. In other words, heavy, heavy, heavy rain. Jeff and I headed back to Wichita pausing for gasoline. The final shots are out of Tonkawa, OK. 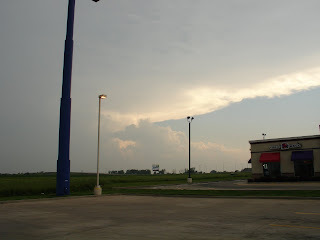 There's a Dairy Queen and a truckstop here, and it seems that this place has a special ability to pull storms to or near it. I've seen about three tornadic situations here. It scares me to think about what has happened over the last five days. There has been a large loss of life, property, and 172 reports of tornados. This isn't normal. 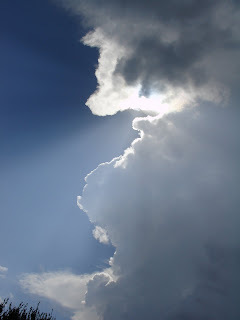 Be aware and keep your eyes to the sky. Today's probability is overhead in Wichita. I'm tired and going to bed. As my wife said in shock "What do you mean you're in Perry, OK?" Stayed up last night watching the crazy weather all over Kansas. In all there have been 111 tornados in the midwest Thursday and Friday. Greensburg had a near hit. Watched the doppler feed going into town and thought that Greensburg rebuilding Green was going to be a distant memory. Somehow the tornado lost its punch before entering town and became a mesocyclone. They got real lucky. And I am rested up!!! There isn't anything even remotely possible until late next week. That's okay, I'm being a lazy stormchaser. 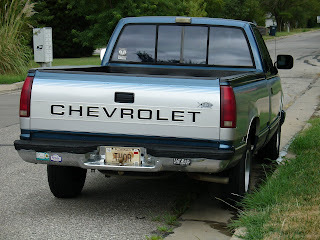 This is my old truck I used to chase in. Sold it when I paid $60 bucks to fill it up. My small car cost me $42 this week. 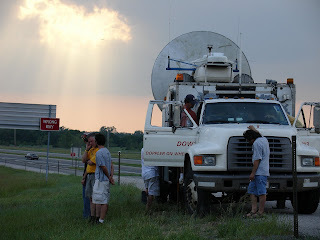 I think these are the guys with the only documented picture of the tornado. I did a huge post on GreensBurg and the computer ate it. So the long and short of it . 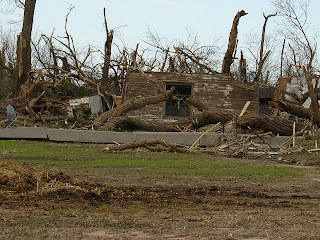 . .
At 9:45 p.m. CDT on May 4, 2007, Greensburg was hit by an EF5 tornado. 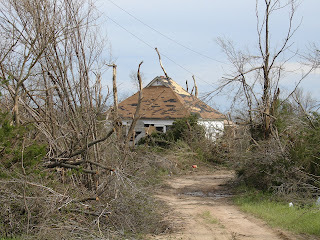 The tornado was estimated to be 1.7 miles (2.7 km) in width and traveled for nearly 22 miles (35 km). Ninety-five percent of the city was confirmed to be destroyed, with the other five percent being severely damaged. The National Weather Service estimated winds of the tornado to reach 205 mph (330 km/h). I was in Pratt that Friday, decided to come home to see family. As I left Pratt, I noticed a lot of chasers staging on the East side of Pratt. The National Weather Service issued a high chance of severe/tornadic weather, something they only do a couple times a year, for the Dodge City area. I came home and at 9:30 turned on the TV. On doppler radar, a glob came out of the storm and ate Greensburg. I was told by one of the locals that a 92 year old man hid out from the storm in his basement. The storm roared overhead and lifted his house, threw his truck into the basement, and it killed him. What mother nature wants, mother nature gets. If you have the money in these tight economic times, please donate to the American Red Cross. 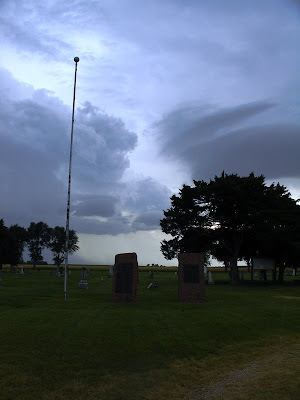 They had stations in Greensburg and Pratt well over six months after the storms hit. They have already been very active this year too, and the seasons only getting underway. A 55-year-old Pretty Prairie man died at a Wichita hospital this morning after hitting a deer with his motorcycle in Reno County on Thursday night. Robert Crandall was riding his Harley Davidson west on Pretty Prairie Road in southern Reno County just after 9:20 p.m. when a deer came out of the south ditch, Reno County Sheriff's Capt. Wayne Baughman said. The motorcycle hit the deer and carried it for about 165 feet before stopping on the shoulder of the road. A passing motorist noticed the accident and called 911. Thursday's severe weather prevented a rescue helicopter from flying to the scene, so a Pretty Prairie ambulance brought Crandall to Via Christi Regional Medical Center-St. Francis Campus. The case remains under investigation, Baughman said, but there are no indications that alcohol or drugs were involved. Crandall was not wearing a helmet, he said. Wow, This is what I saw Thursday night. Man, this bums me out. Five people have died this week on motorcycles and this was a stones throw from the accident the night before on K-254. I really want to ride again. Yeah falling off a motorcycle and freaking bumming out your knee changes a little bit of an outlook. So do kids . . . and I known a couple people hit deer on a bike and live. Then I think of my dexterity and maybe I should stay on four wheels. Those who know me know I can't go great distances to go chasing right now. 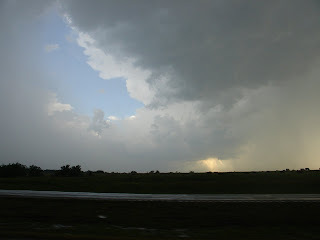 I ran up to Towanda and got these pictures of a rather tornadic squall line. I'm not sure what was going on there, because this happened too and it was serious. The cold front sounds like it caught up to the dry line and we have a nasty storm overhead. I'll post more, later. Good night. That word kills me. In the last few outbreaks anywhere near here, that word has popped up. Today is no exception. 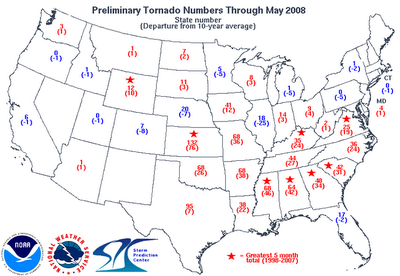 Hell, we're smack dab in the middle of the tornado anniversaries. Hillsboro, Greensburg, Udall. It’s been kind of a dry chase season in Wichita. Heard about another chaser going down to Oklahoma and going on a night chase. He told me that he couldn’t see it, but heard it, and then the transformers started blowing around him. So far, we have moisture from the south and a cold front/dryline forming to the West. They are guessing some super cells forming then turning into a squall line and heading into Missouri. I like the foreboding words at the end of the analysis . . . AND PERHAPS A COUPLE TORNADOES. Guys, I’m like a kid at Christmas. The doc said today maybe one more week before Baby B. SO I HAVE TIME FOR ONE GREAT CHASE MOTHER NATURE! Sounds like it's going to be a slow week in Kansas. Thursday (Thor's day) night might provide a little excitement. So in the mean time, I'll post this. 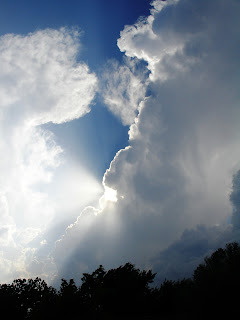 I took this last summer in Iuka, Kansas. 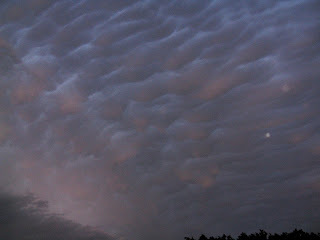 First one was of some strange clouds that I shot while in a cemetery. Second one was the same storm after it got angry. So I'll post some old favorites. The Severe Storm Lab out of Colorado. They were out chasing with the TIV vehicle (now featured on the Travel Channel). These guys (Severe Storm Lab) are my heroes. My geek is showing. Note: I have it labeled as OU mobile storm lab. This is wrong. 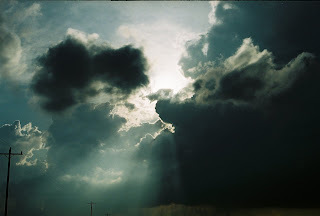 I love dramatic cloud photos, and sometimes you just get lucky, don't you punk. This is in Reno County, Kansas. Chased a squall for a couple hours, found a great wall cloud. Watched 15 tornados drop in 8 minutes (yup, up and down that quick). This couple pulled up next to me and asked what to do, it was there first tornado, and they wanted to see it. I was changing lenses and was distracted (not a good trait of a chaser). I told them to go up the road about a mile and you could see it well. One mile up the road is where the debris cloud is on the ground. I took a picture before they went to OZ. More the next time I can't sleep.